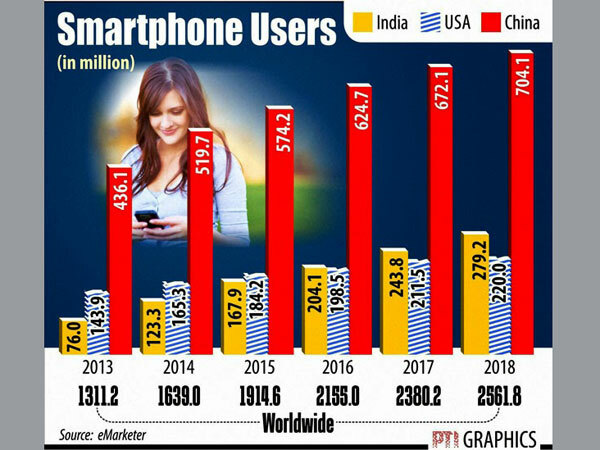 According to eMarketer in 2014, India had 123 million smartphone users. This will grow to 200 million by 2016. India has been struggling to grow its internet penetration for years, it has been just around 10%. The growth of smartphone user base will bring in the much needed boost to the internet eco system. China is far ahead of India (seen in the infographic below). The government has to work towards increasing this growth faster in India. The Indian language publisher community strongly believes they can be a catalyst in the growth of internet “usage”. We do need help from the government of India in growing the internet infrastructure. There is a lot for India to learn from South Korea where the last mile connectivity is owned by the government. Something India should replicate. Most telcos are unhappy with the low data usage of their customers. ARPU in India has to grow. Most telcos are unhappy with the low data usage of their customers. The number of mobile internet users in India is likely to touch 213 million by June 2015 from the 173 million in December 2014. Mobile Internet users in urban India: March 2015* – 143 million, June 2015* – 160 million. Primary activity of mobile Internet users in India: Email (74%), social media (61%). Average mobile bill in India: Rs 387 in 2013, Rs 439 in 2014. Monthly mobile bill pie: 63% spent Rs 101 – Rs 500, 26% spent Rs 501 – Rs 1,000, 7% spent less than Rs 100. Percentage of mobile bill spent on mobile internet in India: 45% in 2013 (Rs 173), 54% in 2014 (Rs 235).